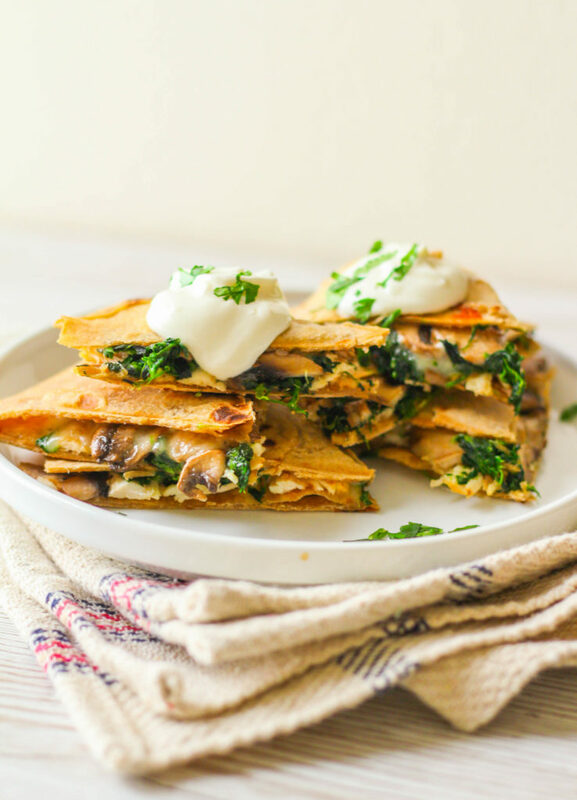 Melted pepper jack cheese, moist shredded chicken, and fresh mushrooms and spinach all come together in a homemade whole wheat tortilla. This post is sponsored by Sanderson Farms. All opinions are my own, thanks for supporting brands that make Zen & Spice possible! Have I ever told you about the time my husband bought me a quesadilla maker for one of my birthdays while we were dating? I think it was for my birthday– the very first year we started dating. That was over 7 years ago and that quesadilla maker is still going strong! Here’s a comparable one on amazon if you’re interested in one of your own. Today’s post featured Sanderson Farms chicken, a product I’ve been working with for the past couple months, developing yummy recipes! Sanderson Farms is natural chicken with 100% natural chicken, with no additives like carrageenan or salt water to plump. They’re also never frozen and are farm to market fresh. It’s really important to me that the meat we choose to buy is humane, and Sanderson Farms chicken is from a cage free environment. Not many chicken brands can say these things about their product! I made a big batch of the fixings for these quesadillas, and then we ate them all last week for lunch. I made the chicken in my Instant Pot! I seasoned it with all-purpose grilling seasoning, and placed them on the bottom of the instant pot pan. Then I added some chicken broth (always, always add liquid when using the instant pot). 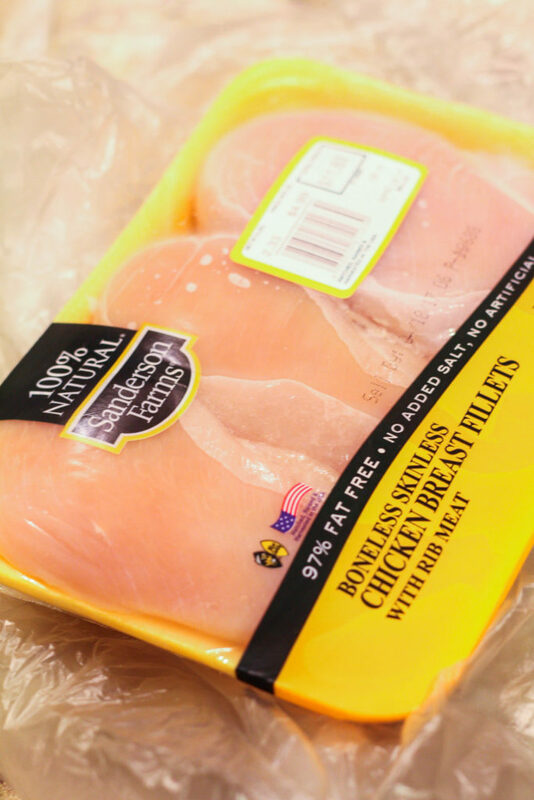 I pressed the “poultry” button and we had fully cooked, moist chicken breasts in 15 minutes! I used a fork and knife to shred the chicken, which made it easy to add to quesadillas. 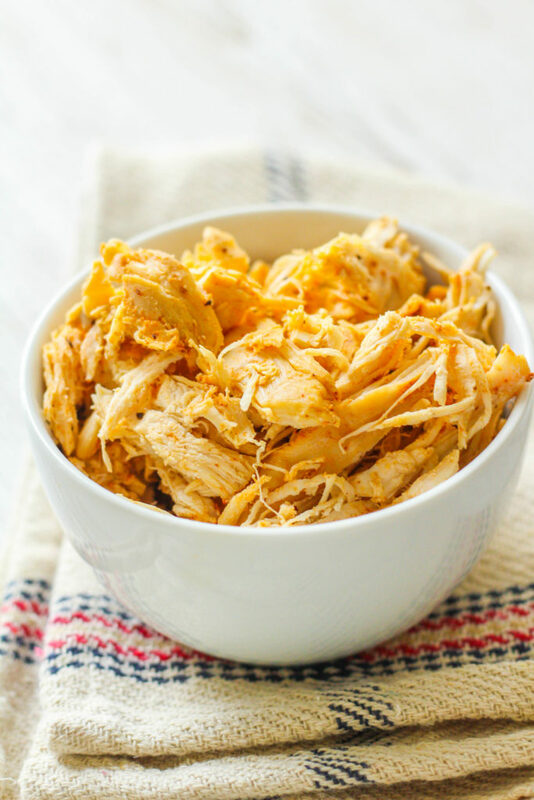 Three large chicken breasts made about 4-5 cups of shredded chicken, which was more than enough for the quesadillas for both of us (10 total) plus extra that we froze. I made these homemade whole wheat tortillas by The Lean Green Bean — they’re amazing!! And SO easy. Mine keep turning into odd shapes when I try to roll them out by hand, so I invested in a tortilla press this week. Can’t wait to try that out, hopefully it will help me form regular circle tortillas. 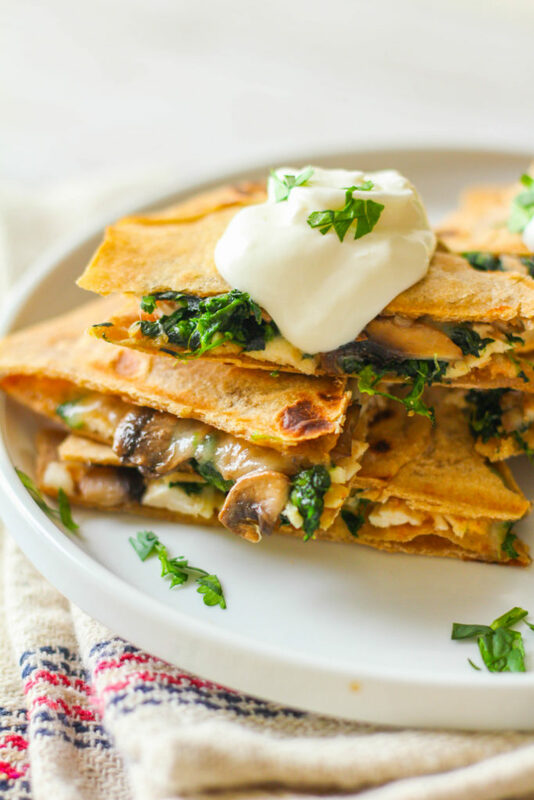 There’s something about the combination of spinach and mushrooms that’s so magical…. am I right?! What is it about those two that make them go so well together? My whole life, that’s been my fav combo– on pizza, pasta, quesadillas, eggs… the possibilities are endless. What is your go-to veggie combination?! Just look at that melted dollop of sour cream…just waiting to get eaten!! 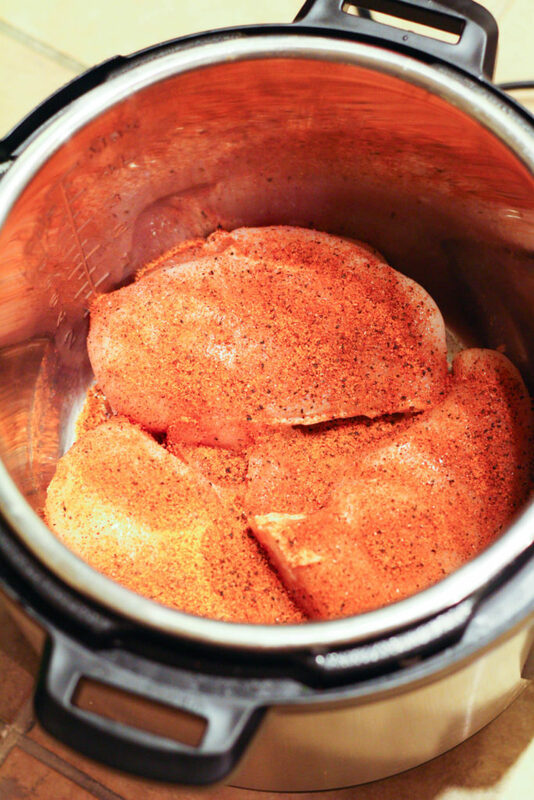 Season the chicken with all-purpose seasoning and place into the bottom of the Instant Pot. Pour in the chicken broth. Press "poultry". It should automatically start for 15 minutes on the timer. Meanwhile, sautee the mushrooms over medium heat in a small skillet with a little cooking spray. Remove when the mushrooms have cooked through. Microwave the spinach according to package instructions, then drain and press out the water. When the chicken is done, use a fork and knife to shred the chicken. Turn on your quesadilla maker or heat a large skillet over medium heat. 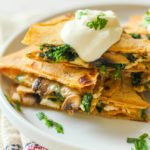 When ready, build your quesadilla: tortilla, chicken, mushrooms, spinach, cheese, and top with another tortilla. Cook until crisp and golden brown on each side. Serve with a giant dollop of sour cream. 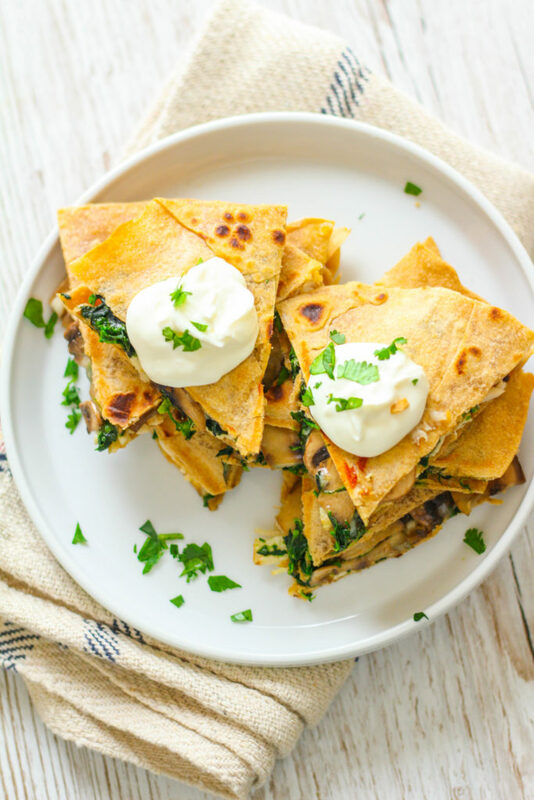 i had no idea quesadilla press existed – so many dinner possibilities…love the combo of spinach and cheese together. I loveeee a good quesadilla. Mushrooms are my favorite! YUM! Mushrooms and spinach – the perfect combo :-).